Judy Wicks, a pioneering social entrepreneur, co-founded the Businesses Alliance for Living Local Economies (BALLE) in 2001, with financial help from Ben Cohen. Twelve years later, more than 500 people came to BALLE’s annual conference, and their politics ran the gamut from liberal to conservative. Judy is talking about Project Sunlight, Unilever’s ambitious plan to decrease its environmental footprint, empower small farmers, and more. “I admire Unilever’s efforts to become sustainable. The problems our planet faces are dire. Time is of the essence, and we can’t afford to oppose anyone’s efforts to move in the right direction, especially when people are proposing to do things on a large scale, as Unilever is doing. But ownership matters. It seems to me that as long as large corporations have as much power as they do, there will always be huge economic and social inequality and we will never reach the just world we believe in. “BALLE wants to achieve a fair and sustainable economy, and reduce our carbon output for our very survival. We want to do this through decentralization, beginning with basic needs like food and energy. We want to put economic power back into the hands of communities through local business ownership. That’s why our support cuts across political lines. We’re for community self-reliance, and self-reliance is a deeply American value. 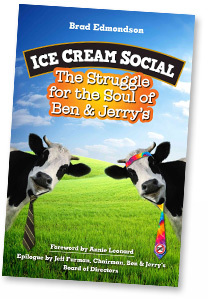 “I used to see Ben & Jerry’s and The Body Shop as little oases of good in a big, bad world. They were companies I learned from and greatly admired. But nowadays I see them as chain stores. And chain stores are like invasive species to local economic ecosystems. We need to encourage locally made ice cream and soap, even though we’re using the business practices that companies like Ben & Jerry’s pioneered. Judy is also the founder of Philadelphia’s White Dog Cafe. Her well-written memoir of a career spent mixing business and social activism, “Good Morning, Beautiful Business.” was published in March 2013. For more information, go to judywicks.com.